In October 2016, the Department of Medicine announced the creation of the new Section of Computational Biomedicine and Biomedical Data Science , making it the 15th subspecialty section within the Department. 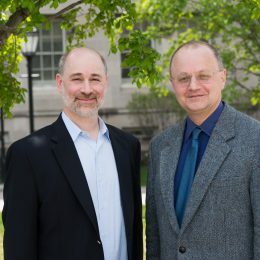 The new Section will provide an intellectual home for faculty whose research interests encompass computational biomedicine; biomedical data science (data science and its applications to biology, medicine and healthcare), and biomedical informatics (bioinformatics, translational informatics, and clinical/medical informatics) and will be co-led by Robert L. Grossman, PhD and Andrey Rzhetsky, PhD. Biomedical data science and computational biomedicine are becoming increasingly important for making discoveries in the biological sciences, for improving medical care, and for contributing to the emerging field of digital health. The Section’s mission is in research collaborations with the University faculty who have an interest in biomedical data science and computational biomedicine. The Section will also synergize with campus efforts in these areas, including with the Computation Institute and the campus initiative in data science being led by Professor Michael Franklin, Chair of the Department of Computer Science. Section faculty will contribute to training computationally literate biomedical scientists in BSD and at the University at large. Robert L. Grossman, PhD, the Frederick H. Rawson Distinguished Service Professor of Medicine and Computer Science, is the Chief Research Informatics Officer (CRIO) of the Biological Sciences Division and Director of the Center for Data Intensive Science (CDIS). He is also a Senior Fellow and core faculty member in the Institute for Genomics and Systems Biology and the Computation Institute. His research focuses on bioinformatics, data science, and data intensive computing. Dr. Grossman currently serves as PI of the NCI Genomics Data Commons. Andrey Rzhetsky, PhD, the Edna K. Papazian Professor of Medicine and Human Genetics ,also serves as a Pritzker Scholar and a Senior Fellow of both the Computation Institute and the Institute for Genomics and Systems Biology. Dr. Rzhetsky’s research is focused on computational analysis of complex human phenotypes, including human diseases. Biomedical data science and computational biomedicine are becoming increasingly important for making discoveries in the biological sciences, for improving medical care, and for contributing to the emerging field of digital health.